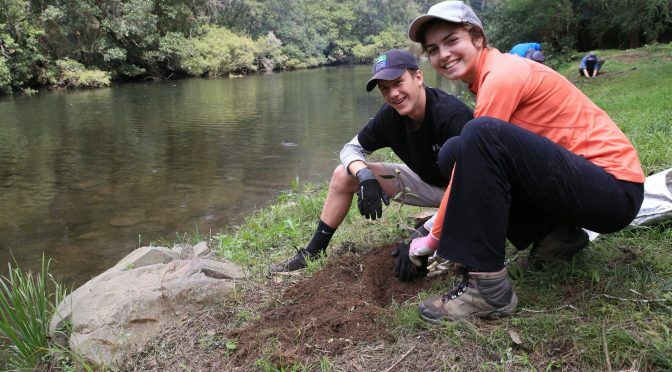 ​Barrington Outdoor Education offers eco camps for young people aged 14-17 years: 5 days alongside the beautiful Barrington River that includes a riparian restoration project. ​You’ll help identify weed species, assist with weed removal, erosion prevention, riverbank stabilisation with tree planting, seasonal seed collection and propagation. In between there’s plenty of fun to be had, you’ll be canoeing on the Barrington River, abseiling the Buccans Buccans overlooking Gloucester and taking a mountain bike for a spin on the purpose-built riverside trails. ​At the end of each day, take a quick dip in the rapids at The Steps or relax by the fire in the tipi chill-out zone. Evening entertainment includes eco spotlighting, star gazing and campfire games. Awesome! ​Our eco camp offers you a journey with a purpose and a place for personal growth. Other lifelong skills achieved are teamwork, self-reliance, determination and cooperation. – all meals while on program, all transfers while on program and all equipment for paddling, mountain biking, abseiling & campfire games.